Who Are the Main Operating Room Equipment Boom Suppliers in Canada? 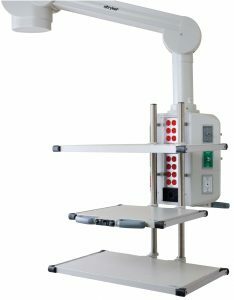 Recent Posts Who Are the Main Operating Room Equipment Boom Suppliers in Canada? 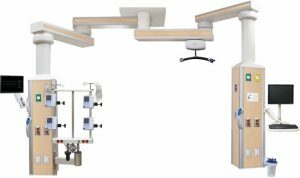 Here at Meditek, we’ve had the honour of being a part of a few “firsts” in terms of installing state-of-the-art boom pendant systems in Canadian hospitals. We were a part of the install for Canada’s first hybrid operating room to feature a robotic C-arm imaging system. From the initial consultation to the installation, we also played a major role in designing and implementing Western Canada’s first Interventional Cardiac Operating Room, which was only the second one in the world at the time. 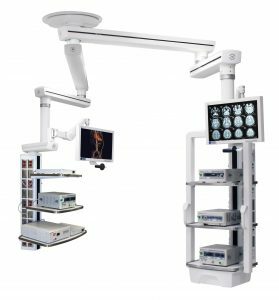 Needless to say, we’ve been around and know our stuff when it comes to tackling the question of who are the main operating room equipment carrier boom suppliers in Canada. OR booms, or pendants, are a complicated matter that require a lot of consultation and planning. It’s fair to say that each project will go to tender, as we all know that the cost of operating room boom systems can get expensive very quickly. Meditek’s purpose is to educate you with the information you need ahead of a tender process. We aim to provide non-biased and truthful information in order to give you the tools you need to make the decision that will benefit your hospital or healthcare facility the most. The following are the most popular OR boom suppliers in Canada. Please note that there could be OR boom companies not listed in this article. The Amico Corporation, founded in 1974, has a Canadian location in the province of Ontario. Around 2007, Amico started providing ICU booms. Founded in Germany in 1838, Maquet is now a product brand with Getinge. 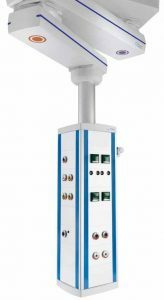 Maquet offers the SATELITE® Ceiling Mount System and the MODUEVO range of ceiling supply units, of which consists of many configurations. Formed in 1972, Skytron is an Original Equipment Manufacturer (OEM) distributor with its headquarters in Michigan. Skytron has the Ergon 3 booms, which include many configurations, and the only manufacturer to have four arms from one mount. Founded in 1985 as Innovative Medical Technologies, the company was rebranded Steris in 1987. Steris offers the HarmonyAIR® surgical booms, which include straight drop units and single or dual arm units, as well. Started by Dr. Homer Stryker in 1942, Stryker is located in Michigan. Trumpf Medical, a subsidiary of Hill-Rom® since 2014, has the TruPort™ equipment management system. The TruPort™ Supply System is the main product and can be configured in multiple ways. Meditek is the Western Canadian distributor for Skytron Ergon 3 booms and boom accessories. 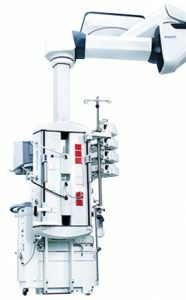 We’ve been involved with operating room boom installations from single boom mounts to complex hybrid ORs. Our services include boom installations at major Canadian hospitals, as well as smaller surgical centres. We do everything from conceptualizing to planning to equipment supply and installation. Send us your questions and our surgical boom experts can help guide you through the process.